There was a ‘loveliness of ladybirds’ clustered on a bent hedge briar along the River Dee in Co Louth. The smartphone image of them was from a regular reader, PG, who walks the countryside especially alert for yellowhammers and goldfinches; he also carries halved eating apples for eager blackbirds! This reader walks in the footsteps of Francis Ledwidge, poet of the Boyne. Blackbirds were Ledwidge’s favourites; there are no poems that I know by him about ladybirds, insects that can charm a child with a tinkling thrill as it alights on hand or arm. The shiny, scarlet beetle with black spots is a tiny purveyor of pleasure universally attractive to children, an insect welcomed without anxiety. There are 19 species of ladybird to be found here, with the seven-spot Coccinella septempunctata most noticed, and all are important to horticulturalists, feeding on aphids and other mites, eating up to 50 a day. Bird predators shy away as they are evil-tasting and can release an unpleasant fluid when threatened. The little creatures hibernate under tree bark and at this time are laying eggs under leaves. When hatched, the grubs will begin aphid feeding, pupate like butterflies and quickly become ladybirds. Warm summers will see lots of them about, getting on with destroying greenfly to the great benefit of gardeners and nursery folk. 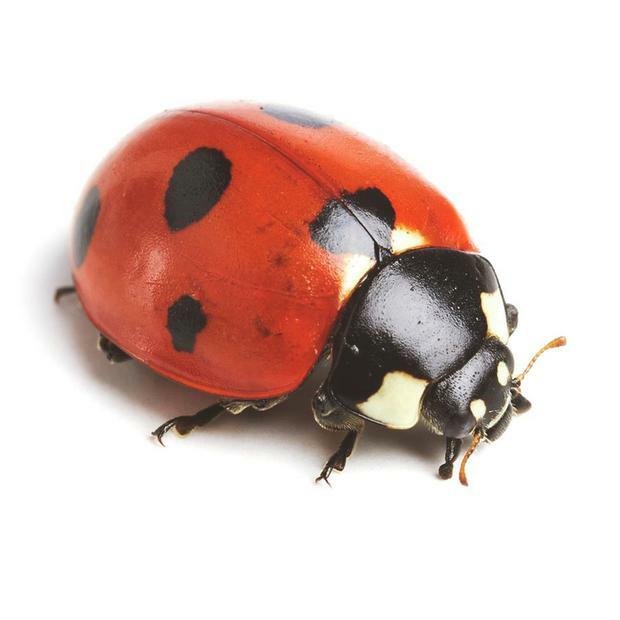 In California, ladybird ‘factories’ are vital in controlling insect damage to citrus crops. This saves millions of dollars. Their child-friendly image was recognised in the early 1900s by two English publishers who began using it as a books’ logo. William Hepworth and Henry Wills set up in business in Loughborough, Leicestershire, and the imprint began appearing on children’s clothing such as dressing gowns, slippers and gloves. The original books enterprise prospered and expanded to adult titles under the benevolent umbrella of Penguin. And I recently saw a new edition – Ladybird Brexit – in the bookshops! However, nature being what it is, the lives of God’s Little Cow (Bain De in Irish; Vaquilla de Dius in Spanish) are not without some serious shocks. While ladybirds prefer to eat aphids and plant mildew, scarcity of food will not prevent them from eating their brothers and sisters. And there are further revelations about wanton promiscuity. Females may spread their favours for up to nine hours at a time, a scientific study showed. Females wasted limited egg stock by mass mating and “squandering” their reproductive cells, according to a Cambridge University report, where Dr Michael Majerus said that there was something “theoretically wrong” about the “ridiculous promiscuity” of the females and “unusually vibrant” males. “Ladybirds are lovely and everybody loves them. We don’t know why they do it,” he said. It may not be a shock to learn that they carry a sexually transmitted disease. Nature can reveal some unexpected surprises even about its most attractive creatures.